Once again today, on this first Tuesday in November, it was the race that stops a nation doing any work during the afternoon. Yep, pretty much anyone who was at work at 3.00pm was in front of a TV or mobile device to watch our special horse race. 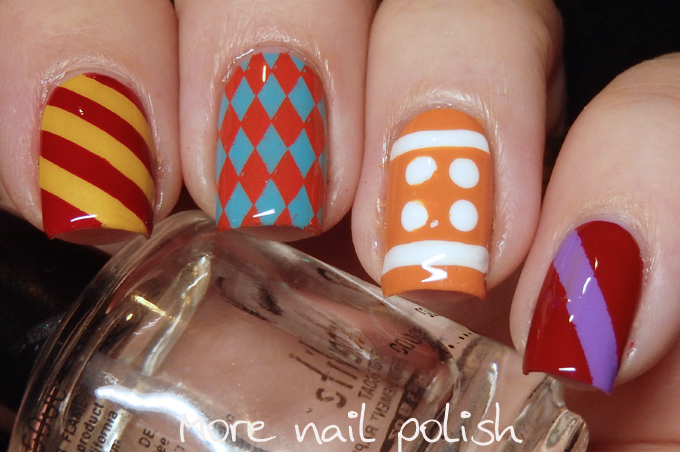 For the third year in a row I created a skittle mani based on my five picks from the racing jockey's silks. 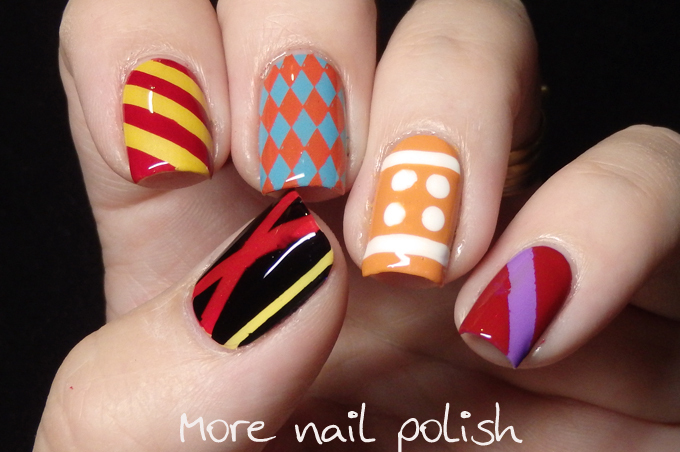 Part of the fun for me is not just painting the jockey silks on my nails, but then putting a huge $20 on those five horses to win a trifecta. The first year I did this I unbelievably won! $1100 in fact. Check my story here. Last year I got two out of the three winners, so I was close but walked away donating my $20 to the TAB. Let's have a look at he designs I did. Here are the jockey silks that match up to my designs. This year I got an impressive zero of the top three! Whoo hoo, I sucked, and I'm kinda pissed at myself a bit too. I allowed myself to be swayed by the odds and chose designs that I liked, but also designs from horses that had better odds of winning. Next year I'm forcing myself not to look at any odds or read anything about which horses are the favourites. I'm going back to my original plan of choosing 100% on the outfit the jockey is wearing, and you will see why below. So the buringin question now is, what were the winner jockeys wearing. Check these out. In a field so many boring silks with solid colours or simple single stripes, these three would have to be three of the brightest and prettiest ones, but like I said, I didn't choose some of them because of their odds - specifically the winner with that pretty purple check pattern who was a 100/1 shot at winning. It certainly is fun watching the race on TV and looking down at your nails to see where your horse is running, it makes for a great conversation piece too. Did anyone out there happen to back today's winner?